I sometimes read posts on this forum and wonder why my corns act differently than what I'm reading. A case in point is males that go off feed in the spring apparently due to breeding season. I've read that some males go off feed for anywhere from 2 months to 5 months. None of my males stopped eating at all despite breeding females all through the spring. I'm wondering how many forum members with multiple breeding age males have them stop eating for any period in the year? Hi T - I can tell you that at the time that I had about 40 breeding males, that only a handful ever went off feeds consistently. I think the whole purpose of calling attention to the behavior is to reduce concern, or not worry about it when it does happen. Well, I probably shouldn't say anything else, I don't want to jinx myself next season. LOL. I was really shocked when I read that some were experiencing a high level of egg binding with their females this year. When I raised pigeons egg binding was usually caused by a lack of calcium. The egg shell would be too rough to pass normally. This may not be true with snakes, but just to be safe I always dust the mice fed to the females during breeding season with calcium/D3. Once in a while I also dust with vitamins. I know, I know, some will say this is unnecessary, but I haven't had an egg bound female in quite a while. Her actions have nothing to do with sexual maturity. There's something else going on and I wonder if it has anything to do with your feeding schedule. Feeding her 4 rat pinkies twice a week seems excessive. Rat pinkies usually weigh between 5 and 13 grams. Even at the lowest weight you are feeding 40 grams per week. 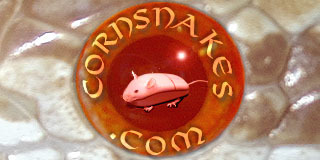 I feed my adult female corns once per week with adult mice weighing an average of 24 grams to maintain them. Do you know how much your female weighs? Unless she weighs over 300 grams she is eating way too much. Internal fat is a health concern for snakes. I'm just speculating, but overeating my be the cause of her restlessness. I do have females that would eat every day if I allowed it.